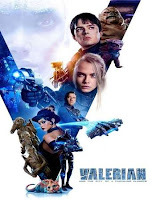 Valerian and the City of a Thousand Planets 2017 | FunToMovies 300 Movies '+g+"
Story line: In the Century XVIII, the space station Alpha is a city where beings from different planets live together exchanging their knowledge and culture. Peace is granted by a human force, including Major Valerian and his partner Sergeant Laureline. They are assigned by the Defence Minister to retrieve the last species of converter in a dangerous mission. They succeed and back to Alpha, unknown humanoids abduct Commander Arun Filitt expecting to steal the converter. They head to a forbidden area that is infected but Valerian and Laureline follow them and disclose a hidden secret about the race and the infected area.